It has truely been busy and I have so much to catch up on! I hope everyones Thanksgiving was as good as ours was. We did a lot of playing and sleeping in late. 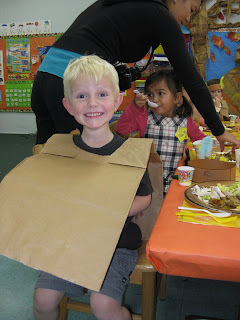 So On Tuesday the kids had their Colonnial Days. 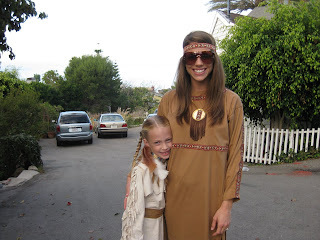 Mak went to school dresssed as an indian and since I was helping at school I got dressed up too. Although Mike said I looked like a hippie and not an indian. What do you think? On Thursday I ran the Turkey Trot. I finished in 56 mins! I know for sure I could've done it in 50 mins if it weren't for the 10,000 runners crammed into one car lane and pouring down rain!!! I was wearing a waterproof jacket that was clearly not water proof for that amount of rain and my shoes weighted 5lbs each! 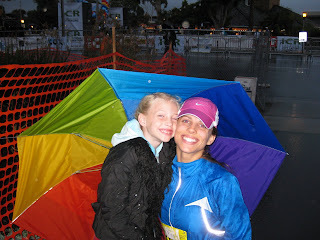 I actually like running in the rain but that was a major rain storm and I was freezing afterwards! I love my fam so much! They all came out and stood in the rain to support me and never complained once about it. 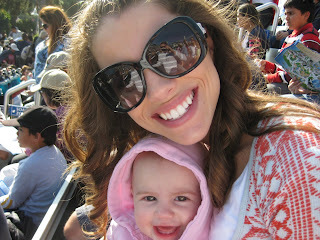 On Saturday we took my parents and the kids to Sea World. The kids had such a blast. Bentley loved the shows! 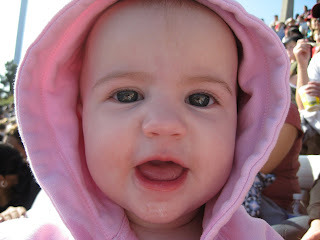 When the croud would clap she would get so excited and start laughing and clapping herself. She thought everyone was clapping for her, it was so funny! 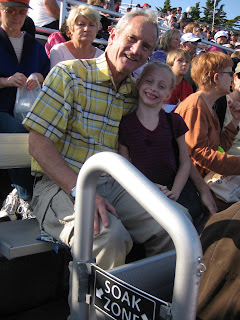 This is my Dad and Makayla sitting in the soak zone at the Believe show with Shamu. Saturday we were lucky enough to go on a date. We decided to go to Disneyland and ride some big kid rides. We got a picture with Mickey and Mike got a little jealous that a mouse was getting more action from his wife than he was. Look at that Hot Mama, you rock for running the turkey trot. And how fun you got to dress up, I think you look a little like Pocohantus. A hot looking one. Glad to be back. Spin was rough today not having done anything in ten days!! Thanks for having lunch with me. I missed my friend!!! 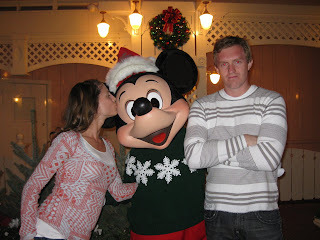 Not loving Mickey huh Mike? You guys are the cutest family. And you have such cute pics of the kids on the page and Moka you are beautiful. Anyway how fun is your fam with all the trips and everything? 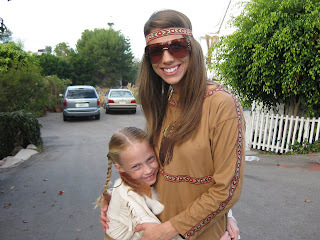 You are the cutest Indian ever...although you would make a cute hippie too! GOod going on the race. I want to run a half marathon so bad I have been training but all the races are on SUnday up here bummer city! Cute Moka! That is fun that you dressed up! Cute little indians. We need to do a dland trip soon! ok--that was me I need to sign joe out!